Is your child a picky eater? New rules have schools across the US fighting to make them eat more fruit and veg. But does offering those foods actually make them eat too? A new report reveals the truth. Are kids who are served more fruits and vegetables more likely to eat those foods? This question, posed by a research team, appears to be almost dumb. Picky eaters are extremely common among kids of all ages — and there are plenty of adults who shun particular cuisines or veggies too. Something I've noticed is that very little kids, who have recently started to eat solid foods, tend to be happy to give anything a try. 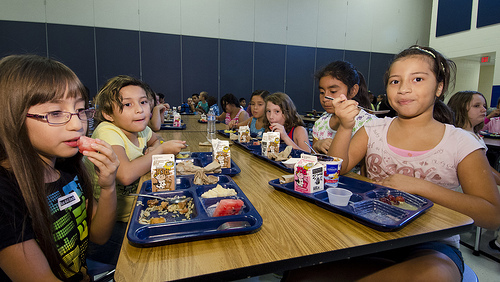 Read More: Kids Are Pushing Back On New Healthy School Lunches, What Now? My kids would eat Brussels sprouts, Korean spicy pepper sauce (straight out of the container! ), lettuce, spinach, artichokes, and all kinds of other foods that one would not usually consider “kid friendly” when they were babies and toddlers. We practiced what is called “baby-led weaning”, which essentially means that babies are introduced to solid foods through self-feeding. The foods that are offered are either just what the rest of the family is having, or a less-spiced version of it. It seemed natural to us that our kids would take to relatively spicy foods, since babies do get a taste of what mom eats in the womb and through breast milk. Today, I have one kid (a girl) who will still eat almost everything I prepare. I also currently have a picky eater. He's four, and he'll still eat plenty of vegetables — since we are vegetarian, he doesn't really have much choice — but he also consistently refuses to eat certain foods. He has black-listed lentils, chickpeas, anything with turmeric, most kinds of lettuce, and quite a few other things. His picky-eating tendencies appeared when he started interacting with other kids who “hated” veggies. Around the same time, my friends started complaining about their kids' bad eating habits, largely picked up when they started preschool. Yet another important milestone occurred within this same time-frame: my son was introduced to sweet treats like chocolate and cakes. These immediately became preferable to anything else. It seems to me that this would be a much more interesting question to be asking. But that's not what the US Department of Agriculture did look into. Instead, they wondered if serving more fruits and vegetables at school lunches would result in kids eating more fruits and vegetables. I'd think you don't need a study to reach a conclusion. It certainly seems nothing but logical that kids would eat more of the things they are actually being served, and less of the things they are no longer being served. It might not work right away, but any kid who is hungry enough will eventually comply. The results of the study were actually a bit more interesting, and may give an insight into how much of a social issue unhealthy foods have become in the modern world. I have heard that there are methods for teaching your children to eat vegetables? Are all toddlers picky eater?